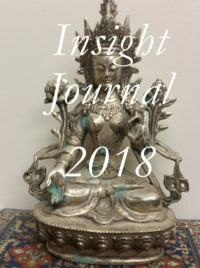 This is the last of three articles following up topics discussed in the course of the Vedanā Symposium convened by Martine Batchelor and held at BCBS from 13 to 16 July 2017. In two previous issues of the Insight Journal I studied aspects of neutral and pleasant feelings; in what follows I turn to painful feelings. For an appreciation of the challenge posed by painful feelings, the Shorter Discourse with Questions and Answers, the Cūḷavedalla-sutta (MN 44), offers helpful indications. In this discourse, the arahant bhikkhunī Dhammadinnā explains that the experience of pain tends to trigger the underlying tendency to aversion. This much is fairly obvious and I will explore in more detail below how to handle this tendency. Here, friend Visākha, a monastic reflects like this: When will it be that I will dwell having attained that experience (āyatana), the experience which noble ones at present dwell having attained? By arousing longing like this for the supreme liberations, unpleasant mental feeling arises conditioned by the longing. By that, one abandons aversion and the underlying tendency to aversion does not underlie that. The same description recurs in the Discourse on an Analysis of the Sense-spheres, the Saḷāyatanavibhaṅga-sutta (MN 137), to illustrate unpleasant mental feeling that is based on renunciation (nekkhamma). The Cūḷavedalla-sutta passage does not imply that longing for liberation in itself removes the tendency to aversion. But such longing serves as a motivation to dedicate oneself to progress on the path to the final goal, the reaching of which will then result in the removal of the underlying tendencies. The presentation in the Cūḷavedalla-sutta is remarkable insofar as it forms a contrast to a fairly common opinion among some meditation practitioners and teachers that one should not generate longing, even for liberation. From that perspective, to have a wish like the one described in the Cūḷavedalla-sutta would not be commendable and at times might even be considered an expression of greed. From the viewpoint of the early discourses, this is clearly not the case. Just as not all pleasant feelings need to be shunned, so also not all unpleasant feelings are to be avoided. Some unpleasant mental feelings, such as those mentioned in the passage translated above, can be supportive of progress to the final goal and are for this reason commendable. This in turn reflects a general position taken in the early discourses, according to which not all forms of desire are seen as problematic. Instead of dismissing desire as such, the question rather becomes: What effect does this particular form of desire have? Does it lead us forward on the path to liberation or not? Needless to say, even with appropriate forms of desire we need to remain balanced. Just yearning for liberation and berating ourselves for not having reached the final goal will not do. But a clear aspiration and a keen wish to become liberated are commendable, even if at times these result in unpleasant feelings. Besides the example given in the Cūḷavedalla-sutta, the same basic principle could also be applied to the type of unpleasant feelings experienced whenever we fail to live up to our own standards. It is quite important that in such a situation we do not avoid such unpleasant feelings by pretending to ourselves that nothing really happened or that what we did wrong does not matter so much. For genuine progress it is of crucial importance that we honestly recognize our own shortcomings (and, equally, our own virtues). Such recognition will inevitably trigger the unpleasant feelings of cognitive dissonance. Yet, the mental discomfort due to witnessing the contrast between how we would like to be and how we really are forms the very foundation of genuine progress. Building on this foundation of genuine acknowledgement, we can indeed gradually learn to live up to our own ideals. Without honest recognition, however, it will not be possible to adopt the appropriate measures in order to counter and eventually remove defilements. This is where the unpleasant mental feeling of renunciation, understood in a broader sense, falls into place. Apart from such commendable forms of unpleasant feelings, however, other types of grief and sorrow do trigger the underlying tendency to aversion. This is particularly evident in the case of physical pain. Being touched by painful feeling an ignorant worldling sorrows, becomes miserable, is aggrieved, wails beating the breast, and becomes bewildered; [the worldling] feels two [types] of feeling; bodily and mental. On being touched by that painful feeling, [the worldling] becomes aversive towards it. The simile of the two darts illustrates the two types of feeling, where the first dart of physical pain leads on to the second dart of the painful feelings caused by our mental reaction to the pain. Being touched by painful feeling, [the worldling] delights in the pleasure of sensuality. Why is that? Monastics, the ignorant worldling does not know an escape from painful feeling other than the pleasure of sensuality. Being confronted by pain, the response of the untrained mind is to want to get away from it as soon as possible. Sensual indulgence appears to be the only option to be able to escape from the pain. This brief instruction contains in a nutshell the solution to the challenge of pain. If the mind does not become afflicted by sorrowing and becoming miserable, the second dart can be avoided. The Salla-sutta explains that when we experience only the bodily feeling of pain but not the mental one, not only is there no aversion, but also the automatic response of searching for sensual pleasure does not get triggered. The reason is that we know an alternative to handling painful feeling other than sensual indulgence. This alternative is to face the challenge of pain with a balanced mind, rather than react to it with aversion. Several classic laboratory experiments with acute pain showed that tuning in to sensations is a more effective way of reducing the level of pain experienced when the pain is intense and prolonged than is distracting yourself … the sensory, the emotional, and the cognitive/conceptual dimensions of the pain experience can be uncoupled from one another, meaning that they can be held in awareness as independent aspects of experience … this phenomenon of uncoupling can give us new degrees of freedom in resting in awareness and holding whatever arises in any or all of these three domains in an entirely different way, and dramatically reduce the suffering experienced. During the Vedanā Symposium held at BCBS, Sara Lazar presented some neuroimaging work concretely demonstrating this phenomenon of uncoupling. The brain has one network that evaluates the sensation of pain (intensity, throbbing, tingling, aching, etc.) and a separate network associated with the thoughts and emotions about the pain. When long term meditators were exposed to a hot, painful disk on their arm, activity in the sensation-related network increased while activity in the emotion-related network decreased. This was the exact opposite of the pattern observed in control subjects with no meditation experience. In fact, even though these subjects tried to shut down the pain by controlling it, afterwards they reported their experience in distinctly more unpleasant terms compared to how the meditation subjects described their experience. Across almost all mindfulness/pain-focused experiments, the unpleasantness dimension of pain was significantly more attenuated with respect to pain intensity. The potential of mindfulness in this respect is truly remarkable and fully in line with what discourses like the Salla-sutta suggest. A key aspect here seems to be the ability to use mindfulness to remain receptive and open to what happens without immediately reacting. This helps diminish and eventually completely avoid the second dart of mental pain. The impressive ability to avoid the second dart of mental grief does not yet exhaust the potential of mindfulness in relation to painful feelings. Sustained practice of the second satipaṭṭhāna, contemplation of the three types of feeling (pleasant, unpleasant, and neutral), reveals the surprising degree to which it is natural for the body to give rise to pain. This is a crucial insight, since the second dart takes a considerable part of its impact from the tacit assumption that we are somehow entitled to be free from pain. Therefore, pain should not happen. When it does manifest, this feels almost unfair: Why me? What have I done to deserve this pain? Yet closer inspection shows that the body is a constant source of pain. As we sit in meditation, sooner or later bodily pain forces us to change posture. Even the posture of lying down cannot be maintained for long periods without eventually giving rise to pain and the need to turn over and change the body’s position. Aside from the pain that arises when the body is motionless in any posture, there is the irritation caused by the outside temperature. Now it is too hot, soon enough it is too cold. We are forced to adjust clothing or turn on a fan or the heating in order to prevent painful feelings due to the temperature. Another dimension of the same predicament is the need for food and drink. So much of our attention, time, and resources are spent catering to what we would like to eat and drink. Not only catering to our own preferences, but also creating and strengthening such desires in others receives a great deal of attention and publicity. But the truth of the matter is that, in order to avoid the pain of hunger and thirst, we must eat and we must drink. When that pain has successfully been addressed, at least for a short while, the inevitable result is the need to defecate and urinate. Failing to obey the calls of nature in time will become yet another source of pain. In a way, the restaurant and the restroom are equally facilities for pain relief. Taking a deep breath feels so pleasant. This is simply because for a moment the body’s constant demand for oxygen has been satisfied. We must breathe to avoid the pain caused by a lack of oxygen supply. As a practical exploration, we might keep mind- fully track of the amount of time and activity spent throughout the day just for the sake of maintaining the body in a less-than-painful condition. How much time and effort do we spend sleeping, eating, drinking, dressing, washing, and so on? [Though] my body is afflicted, my mind will not be afflicted. A pdf version of this article with diacritics and annotation can be downloaded here.